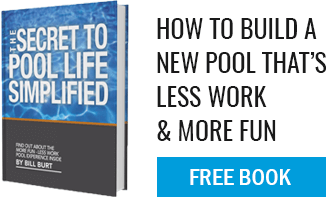 Aqua Pool can get you swimming in an inground gunite self-cleaning pool this summer. A pool can be affordable! We are offering our customers this special offer starting at $365 per month and we want to see you swimming with your friends and family in 2019! Just contact us for more information. We are currently celebrating our 50th year in business. We have been working with homeowners in Connecticut as well as Massachusetts and Rhode Island for half a century on building unique pools that provide a welcome respite from our busy lives. We have experienced designers to turn any pool dreams into reality. We like to say, "If you can draw it, we can build it." We'll work with you on the design and then take you step-by-step through the process of installing your pool. We also offer maintenance services that will allow you to focus on the fun of owning a pool! Aqua Pool specializes in Gunite, which is sprayed concrete, or shotcrete. 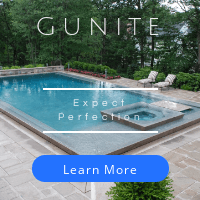 Not only is gunite beautiful and durable, it's the ideal material for customizing a pool. With gunite you can achieve virtually any shape in virtually any size. How does a self-cleaning pool work? Aqua Pool & Patio Inc. is the only distributor of Paramount PV-R self-cleaning systems in Connecticut. We’ve been installing Paramount systems for more than 35 years and we believe PV-R is the best product on the market, from the leading manufacturer, Paramount Pool & Spa Products. Built right into the pool shell, Paramount PV-R is engineered to clean your entire pool, including floors, steps, benches, even spas. When not operating, PV-R disappears back into the pool floor, making it virtually invisible. There are no vacuum hoses left floating in the pool. All that’s left is a sparkling clean pool that’s ready to enjoy. In-floor systems are more than highly effective automatic pool cleaners. They also function as high efficiency circulation systems. They are so effective that they have been independently certified to save up to 30% on chemicals and energy for the life of your pool. Just fill out the contact form on this page and one of our pool experts will be in touch as soon as possible. You can also call us at 860-623-9886 or email us at info@aquapool.com. 2nd Mortgage Loan Example. 100 percent financial is available. Pool only $55,300, $365 per month, 20-year term at 4.99 percent interest rate. Pool and spa $66,800, $434 per month, 20-year term at 4.99 percent interest rate. Interest rates vary depending on credit rating, prime rate, etc. Watch our latest TV ad featured on WFSB Channel 3!